9 As I watched, thrones were set in place, and an Ancient One took his throne, his clothing was white as snow, and the hair of his head like pure wool; his throne was fiery flames, and its wheels were burning fire. 10 A stream of fire issued and flowed out from his presence. A thousand thousands served him, and ten thousand times ten thousand stood attending him. The court sat in judgment, and the books were opened. 11 I watched then because of the noise of the arrogant words that the horn was speaking. And as I watched, the beast was put to death, and its body destroyed and given over to be burned with fire. 12 As for the rest of the beasts, their dominion was taken away, but their lives were prolonged for a season and a time. 13 As I watched in the night visions, I saw one like a human being coming with the clouds of heaven. And he came to the Ancient One and was presented before him. 14 To him was given dominion and glory and kingship, that all peoples, nations, and languages should serve him. His dominion is an everlasting dominion that shall not pass away, and his kingship is one that shall never be destroyed. 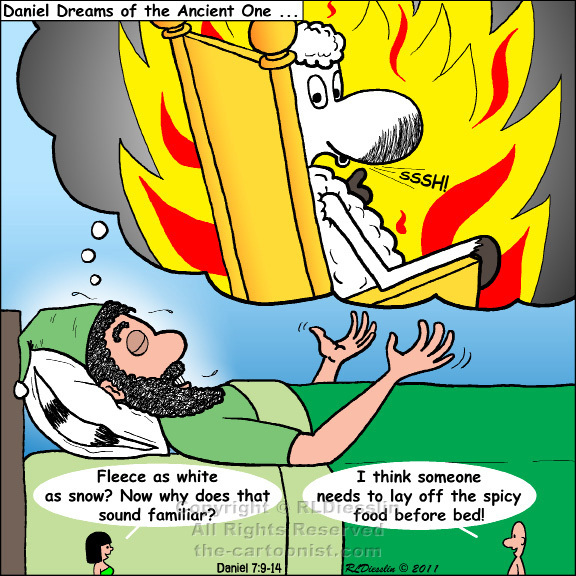 The first half of Daniel concerns the stories about Daniel and friends, and the second half records four apocalyptic visions attributed to Daniel. This excerpt is part of the first vision. In verses 1-8 (just prior to this excerpt) four beasts are described representing Babylon (lion), the Medes (bear), the Persians (leopard) and the Greeks (dragon). In these verses (9-14) the ancient one, God, is seated on the fiery throne and destroys the Greeks (the horn is Antiochus IV Epiphanes). The other nations aren't destroyed just yet. Kingship is given to "one like a human." This is another way of saying the "Son of Man" or Messiah. The Son of Man here has been interpreted in different ways including as symbolic of the faithful Jew or as an angelic being like Michael. Of course the imagery here is found in other books of the Bible including Job, Isaiah, and Revelation. In Revelation and the Gospels the Son of Man is used in reference to Jesus, thus bridging Old Testament prophecies to the New Testament. A sheep on the thrown might be a bit of a stretch, but like I said before, they have good PR.